So it's Halloween time again and I bet you're dying to know what costumes I sewed, knitted, and silk-screened for the girls, right? Absolutely nothing! Both girls picked costumes that involved no crafting. Harumph, I say. 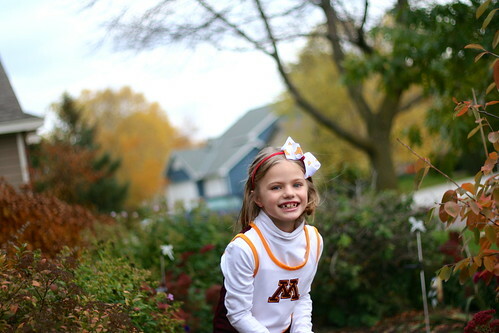 Bella and I had a wonderful evening a few weeks ago just the two of us where we went to Dinkytown and had pizza and bought her a tiny cheer-leading uniform. I could tell she felt so grown up and special and very interested in the variety of tattooed goth skateboarder college students around. 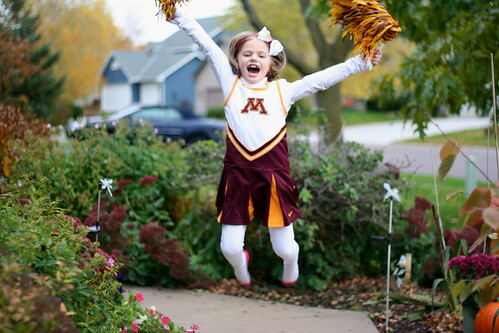 Go Gophers! 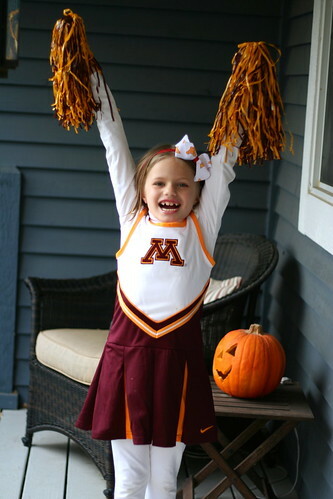 Our favorite part of this costume is that it came with little knickers that say Minnesota. Teehee. 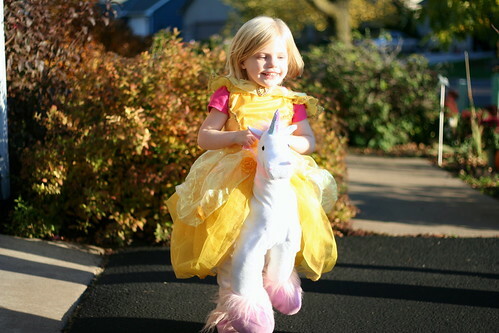 And then there's beautiful Princess Mimi, out for a trit-trot on her royal unicorn. She is quite dissatisfied that her unicorn doesn't fit in her car seat so she can't wear him everywhere forever and ever. 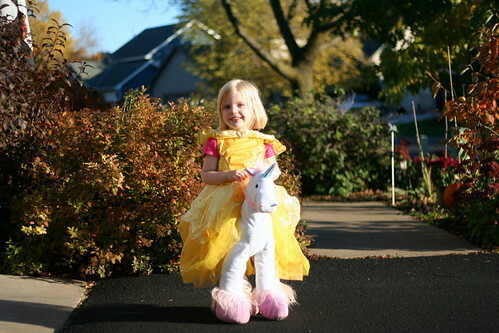 Boy am I glad I found a unicorn costume at Target and didn't have to try to sew one. Although I did joke that it would be funny to make Brent a unicorn costume so that when Mimi got tired, she could switch to Daddy Unicorn carrying her around. But she didn't get tired! 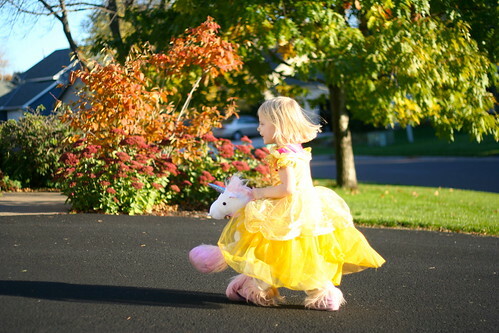 Princess LittleLegs galloped around the whole neighborhood. 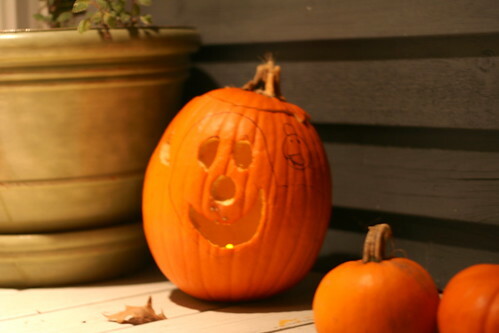 Grandpa did our pumpkin carving. He is very good. 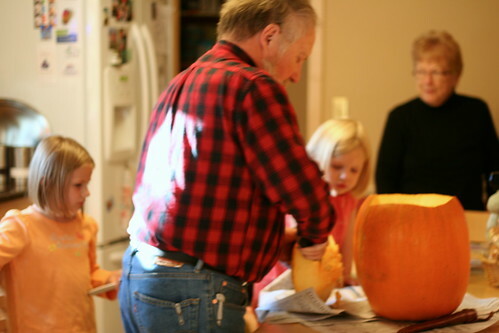 I was bragging to the girls that Grandpa can carve anything. A. NY. THING. So Bella draws an elaborate picture of her stuffed bear and blankie, and Mimi draws Fancy the bunny. HA! Grandpa did a great job on the pumpkins! Here's Brent and I dressed up. 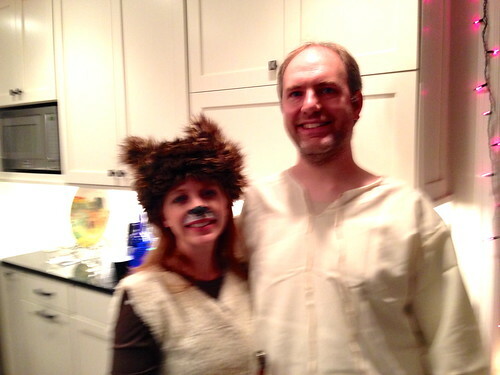 I am the Fox from What does the Fox say. It makes way more sense if you can see me act it out. GERINGDINGIGDINGDING!! 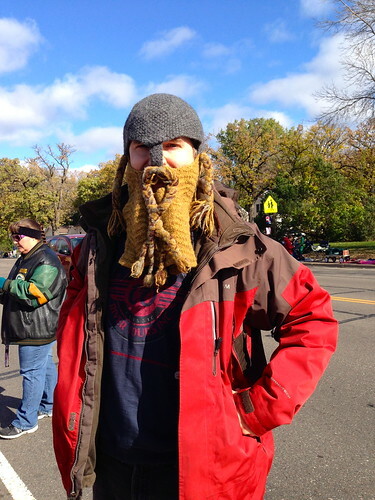 Here he is in his Dwarven Battle Helmet that I made him. Getting in the spirit of the Halloween parade! 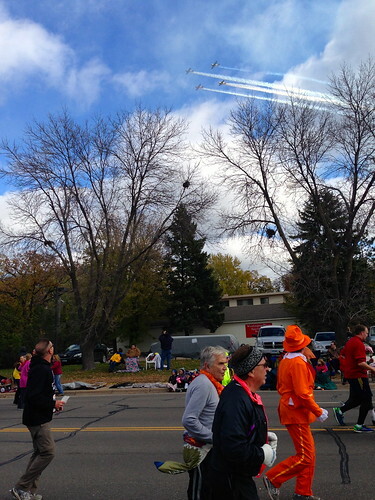 There were very cool airplanes doing fly-overs at the Anoka Halloween parade. We were all very impressed. I was wearing my new down Minne-skirt from the State Fair and feeling cu-u-ute! Didn't seem to get a picture though. 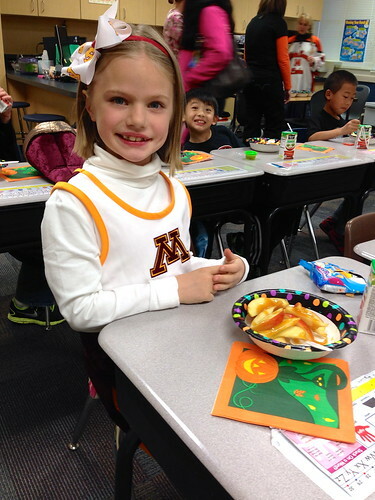 Here's my little girl full of cheer at her class Halloween party, eating a caramel apple. 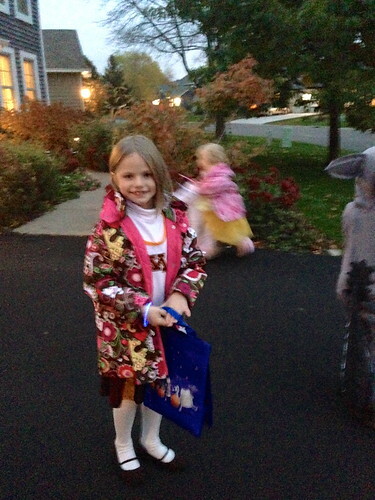 Her school had gotten rid of Halloween for several years. Then apparently the teachers were allowed to take a vote. And yay! It's back! Kids grow up so fast. Why take Halloween away? 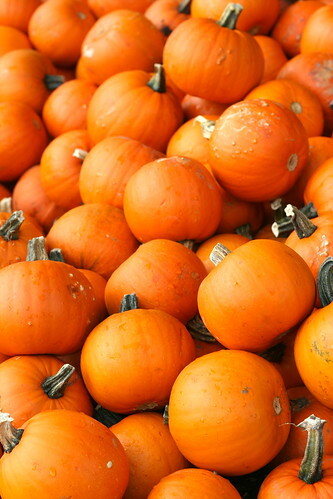 They're just little pumpkins for so long. They trick-or-treated for an hour with friends, going up and down our whole neighborhood and getting bags full of loot. I had an insulated Mickey Mouse coffee cup that was actually filled with wine. And I wore my fox hat. I was cu-u-ute. The next day, Mimi found ONE mini Twix wrapper in the trash can, because she's apparently a candy CSI squad leader, and has a sobbing boneless breakdown because SOMEONE has eaten her candy. I confess. She screams and runs to her room. Brent turns to me and says, "Did we do that for Jimmy Kimmel?"